With HD becoming standard, the ability to watch full HD movies and programs on a large screen is a requirement from most of our clients. 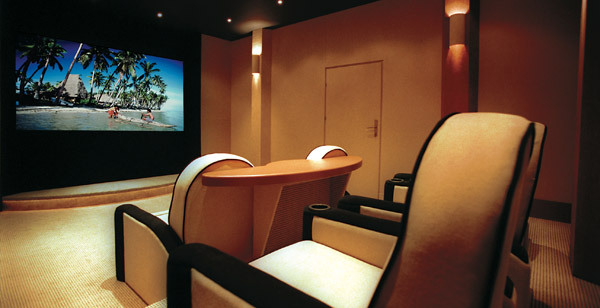 Projectors and screens in living rooms are now widely installed as custom fitted mechanisms allow equipment whilst not in use to be hidden behind art pieces, fabric panels, and motorized trap doors. Even loudspeakers can be invisible without compromising the sound quality. At a touch of a button, an elegant living room can be transformed into a home cinema. From multimedia room to fully certified THX home cinemas, we can advise the best suitable products to fit in specific budgets and requirements.